During first aid awareness week, I thought it may be useful to consider how parents could approach making their children more aware of first aid in the home. In this post I'm assuming a child to parent relationship, but this could equally apply for a guardian, other family members or for friends of the family. Depending upon your relationship with the child or their parents you may want to discuss this with the child's parent or guardian first. I have had some experience in teaching first aid to children including spending a time as Badger leader (St John Ambulance members from age 5) and teaching cubs and scouts. Whilst the amount and depth of first aid knowledge for these groups is less than the training I've given to adults, I'm impressed by how much first aid young children can actually learn. The fact is that during real incidents young children have and continue to save lives as evidenced by the young first aider of the year awards which during 2009 included a child as young as 6 years old [2009 young first aiders of the year]. 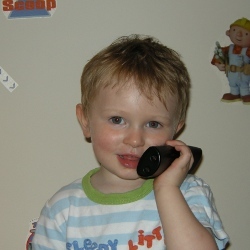 My eldest child is 4 years old and already knows the number to dial if someone is sick and needs help. What age is too young? I don't think there should be a minimum age as such, but I think about 4 to 5 is a reasonable age to start. In the case of my daughter she already knew the phone number for calling the fire service with the help of a Fireman Sam Live on stage DVD , so that was a useful starting point. I've taught first aid to Badgers from about 6 years old, but the syllabus was much less than older children. It is important to tailor the first aid teaching to the age and maturity of the child. For a young child then you can introduce a first aid kit and the basics of calling for help - dialling 999 etc. A little older then it can be useful to introduce the recovery position and some emergency conditions, and for older children then they can learn most of the normal first aid protocols. Who can teach first aid? Whilst I would always encourage adult training to be performed by a qualified instructor, providing an awareness of first aid to children can be done by anyone. Introducing the basics of first aid through the home environment can increase the awareness level for young children and capture their interest to further their knowledge when opportunity arises. If you are covering the very basics such as putting on a plaster or how to call for emergency services then anyone should be able to teach those skills. If you want to provide an awareness of simple first aid then a competent first aider should be able to provide that. 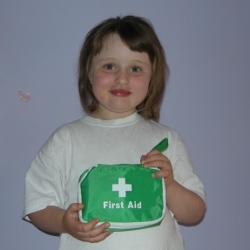 The first aider should be up-to-date with the current protocols (which are much easier than some of the ones in the past), have a recent copy of the First Aid Manual or a reference specifically designed for teaching children and ensure they only cover topics within something that they are able to explain confidently. To provide more comprehensive first aid training it should be provided by someone that is competent in first aid, but that also has some knowledge or experience of teaching children or first aid. First aid knowledge is obviously provided within the youth groups of St John Ambulance, but also by other uniformed youth groups such as the Scouts and Guide organisation. These groups will sometimes perform the training themselves using a first aider or may get trained first aiders in to provide specific training. More information on formal first aid training. Should I tell the child about my asthma / diabetes / heart condition? I think that this is one area where family input can be particularly useful even if your child has received formal first aid training. Many of the occasions where young people have had to perform first aid have been in the family home, some of which relate to existing medical conditions. Your own knowledge and experiences of the condition can come in helpful in the case of an emergency. Again this will need to be tailored to the age of the child. As an example of where this could be useful consider a parent with asthma who is prone to severe asthma attacks. You can explain to the child what an attack is like which may help them to recognise the symptoms and to keep calm. During the attack you may be unable to speak but if they already know that they can dial 999 for an ambulance that action alone can be enough to get help on the way. This is just one example - you will know about your condition and be aware of what help you may need. What about my child's safety? Obviously the child's safety must be first priority. This is the same when adults provide first aid, but is more of a concern with a child which may not be aware of some of the dangers. In the previous example I specifically avoided suggesting that a child be told about where the parent keeps their emergency medication. Young children can be inquisitive when left alone and so any medications should be kept in a locked cupboard out of the reach of young children. If you are diabetic and you make your child aware of where an emergency chocolate bar is stored then that is obviously safer than if you tell them where a inhaler or angina medication is kept. You will need to make a decision based on your child's age and maturity whether they can be fully trusted to not misuse the medication, but the child's safety needs to take priority. Whenever teaching anyone, especially a child, first aid then dealing with danger should be the first priority. By highlighting some of the dangers around the home can make children safer than those that haven't been actively taught about the dangers. There are some child safety resources on the Child Safety Week website. This is all my own personal opinion and not reflective of the opinions of any organisations mentioned on this page or any others that I am involved with.